God knows who would need one of these, but I want one. 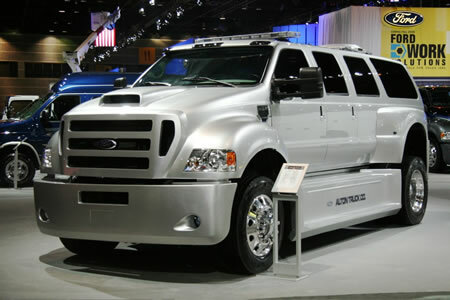 The Ford Alton F-650 is a freak of nature with its 7.2 Liter Diesel Caterpillar engine and 26,000 lbs of style. This truck is huge. Looks like no more Hummers and Escalades for the next blinged out wanna be rap stars… from here on out $200,000 and a commercial driver’s license gets them the Alton F-650!